I recently attended the 2011 American Geophysical Union Fall Meeting, a conference of over 20 000 scientists, many of whom study the climate system. This new area of research was a hot topic of discussion at AGU, and a phrase that came up many times was “more than 100%”. 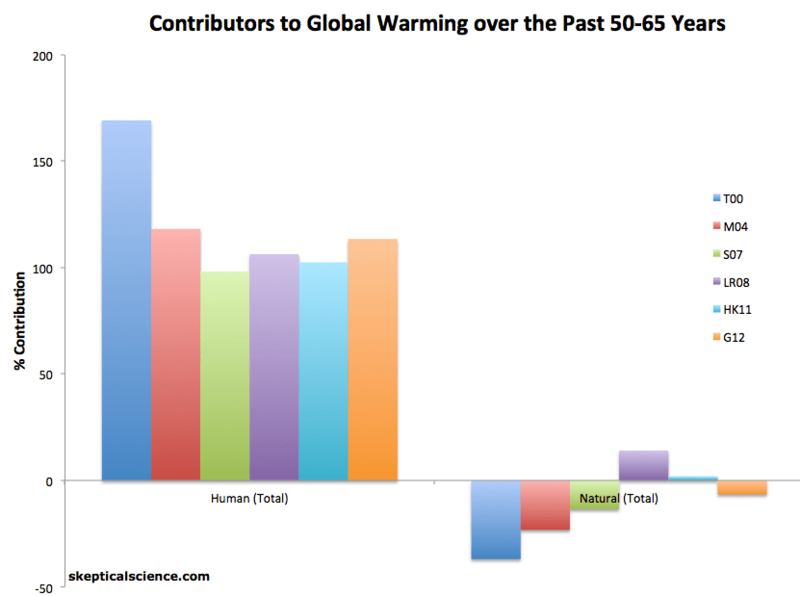 That’s right, humans are probably causing more than 100% of observed global warming. That means that our influences are being offset by natural cooling factors. If we had never started burning fossil fuels, the world would be cooling slightly. In the long term, oscillations of the Earth’s orbit show that, without human activity, we would be very slowly descending into a new ice age. There are other short-term cooling influences, though. Large volcanic eruptions, such as Mount Pinatubo in 1991, have thrown dust into the upper atmosphere where it blocks a small amount of sunlight. The sun, particularly in the last few years, has been less intense than usual, due to the 11-year sunspot cycle. We have also experienced several strong La Niña events in the Pacific Ocean, which move heat out of the atmosphere and into the ocean. 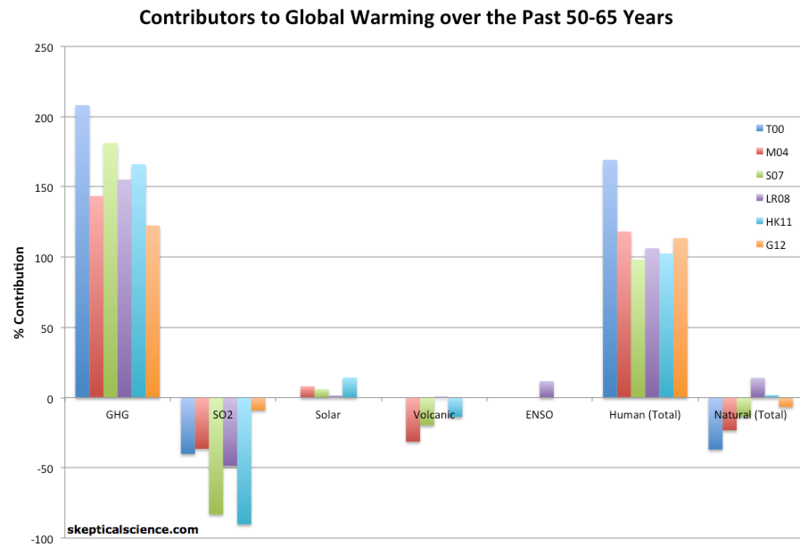 Most of the studies estimated that humans caused over 100% of the warming since 1950, and all six put the number over 98%. Additionally, most of the studies find natural influences to be in the direction of cooling, and all six show that number to be close to zero. If you are interested in the methodologies and uncertainty ranges of these six studies, Skeptical Science goes into more detail, and also provides links to the original journal articles. To summarize, the perception that humans are accelerating a natural process of warming is false. We have created this problem entirely on our own. Luckily, that means we have the power to stop the problem in its tracks. We are in control, and we choose what happens in the future. This entry was posted in News and Reports and tagged AGU, climate change, education, environment, global warming, IPCC, science by climatesight. Bookmark the permalink. Oh good. Yes I’ll keep the same filename and overwrite the old version, so that should take care of it. In summary, the WSJ article just repeated a Gish gallop of well-known myths, and only 2 of the 16 authors have actually published recently in the field (see http://skepticalscience.com/examining-the-latest-climate-denialist-plea-for-inaction.html); the Daily Mail piece ran completely contrary to what the scientists interviewed had actually said, as that particular reporter is prone to doing. Rather underwhelming. I suggest you read those refutations very carefully. Chris, just catching up on all the wonderful replies. That graph you linked to at FadCRU – can you explain what I am looking at in terms of that data? Thanks, P.
The chart shows the global temperature data since 1980 from HadCRU, which is a joint effort by the British Met Office’s Hadley Centre and the University of East Angli’s Climatic Research Unit–so it’s HadCRU, not FadCRU. There are several other global temperature data sets I could have used. They all show very similar trends, but I showed HadCRU because that’s the one referenced by the Daily Mail article you linked to. The red line is the monthly average temperature for each month from January 1980 to the most recently available, which is currently December, 2011. The green line is the least-squares linear trend for the same period. It shows that on average over that period, the temperature is increasing at about 1.5 degrees C per century. Where did you find that quote? Though Nordhaus tends to be conservative about the costs of climate change, he’s also always been clear that a price on carbon emissions will help the economy. So when the WSJ piece misrepresented his work as supporting inaction, he was not a happy camper, understandably. Thanks again for your SkS post. 24 hours later, I am still slightly amazed to find out that William Nordhaus has (for some years it seems) accepted that Sir Nicholas Stern was actually right to warn that climate change must be tackled. Presumably, he would also agree with the International Energy Agency (IEA) saying that time to act is running out? That is to say, as the IEA did in last year’s World Energy Outlook, failure to move away from fossil fuels by 2020 will quadruple the cost of doing so. Nordhaus has advocated for an internationally harmonized carbon tax the entire time he has worked in this field; see, e.g., Nordhaus (1992) for an early paper. You should read his latest book, A Question of Balance (draft online), to see what he thinks. His main objection to Stern was not that Stern wanted to tackle climate change, but that Stern’s calculations use a too-high discount rate (in Nordhaus’s opinion) that over-weights future climate damages. In turn, others have criticized Nordhaus for under-valuing the welfare of future generations. As for “time to act running out”, Nordhaus finds (Table 5-3 in the above book) that to act now would have $5.23 trilion (2005 USD) in benefits and $2.16 trillion in costs, whereas to wait 50 years and then act would have $3.69 trillion in benefits and $1.55 trillion in costs. The net benefit is $3.07 trillion for acting now vs. $2.14 trillion vs. acting in 50 years; they have respective benefit/cost ratios of 2.42 and 2.38. This of course is just a scenario analysis and not a comprehensive sensitivity analysis to assumptions. Thanks for taking the time to reply to me, Nathan. However, I was aware of the nature of Nordhaus’ crticism of Stern; which climate scientists see as deeply flawed because the costs of delaying mitigation are rising exponentially such that no amount of economic trickery (net present value, etc.) can reign them in. Therefore, I guess, I should clarify that I am pleased to learn Nordhaus is – and always has been – an advocate of Carbon Taxes (even if he flat wrong when it comes to accountancy). I don’t think climate scientists are particularly qualified to say anything about the costs of mitigation. But for what it’s worth, as a climate scientist (who isn’t particularly qualified in climate economics either), I don’t see much justification for your claim that the costs of mitigation are rising “exponentially” with time. They do rise, of course, as there’s more to mitigate, but I wouldn’t say they’re rising “exponentially”, nor would I say that discounting is irrelevant to the question of cost-benefit analysis. Nathan, as a geologist-turned-environmentalist, I will always defer to the expertise of climate scientists (i.e. yourself, Kate, dana1981, et al.). So you will have to forgive me for my shorthand and/or unusual choice of verb tense (i.e. “increasing“). What I was alluding to is the near-certainty that, unchecked, the runaway greenhouse effect will result in accelerating growth in adaptation costs and/or negative consequences. In this respect, I believe climate scientists should feel able to speak out about the economic consequences of failing to act. There is some good work out there on “the regrets of procrastination” in climate policy. Certainly anyone who finds a positive economic value for mitigating now will also find a loss of utility in procrastinating. Climate scientists should be able to freely cite this economic literature, but make it clear that this is the work of professional economists, and not their own unqualified opinion. Nice one, Kate (and/or 20,000 scientists at GAU’s Fall Meeting). It may just be another way of describing “global dimming” or, because it forces the reader to think through what is being communicated, “humans are likely causing more than 100% of global warming” could just be the key to making a sceptical world wake-up to what is actually happening. What this leaves out is that humans are also causing global cooling (mainly through sulphates from burning coal). So the warming we’re causing offsets not just natural cooling factors but also artificial ones. As I understand it, the relatively slow rate of warming in the last decade or so (see the comments above) is likely, at least in part, to be caused by increased emissions from coal burning (particularly in China and, to a lesser extent, in India). The distinction between human-caused warming which is offset by natural cooling vs human-caused warming which is offset by human-caused cooling is important because of the differing time scales; CO₂ lasts decades to centuries whereas the sulphates causing cooling only last fractions of a year. True, if you read my entire post, I’ve also got graphics breaking down the human and natural components. GHGs have caused well over 100% of the observed warming in almost every study over every timeframe (one exception, Stone 2007 putting the GHG contribution at 100% over the past century). Anthropogenic aerosols are also the second-largest factor influencing global temperatures in every study. The key word is “estimated”. I am still looking for the term “measured”. You are looking for 0% error. That does not happen in science. No, I am not looking for 0% error. I am looking for some semblance of a scientific measurement, but see none, only theory, modelling, and estimates. You have a very eccentric idea of what science is. I would also recommend reading the discussion between me and a certain John Kosowski in the comments section; although you may have to skim over those by John – as he writes much but says very little (IMHO). Gerald, your phrase “only theory” is pretty revealing. Theory is what science aspires to. Theory is what you end up with when your hypotheses are confirmed and there is broad agreement among experts that you’ve provided an accurate and correct explanation for observations. In science, it doesn’t get any better than that. Sorry, but people who say, “Well, it’s only a theory” typically don’t have a very firms grasp on what science is and how it works. I jumped off this cliff entirely on my own. There was no wind or rockfall that made me slip. Luckily, that means I have the power to stop my free-falling descent in its tracks. I am in control and I choose what happens in the future as I plummet to the rocks below. Unfortunately, not every human action is humanly reversible. In turn, others have criticized Nordhaus for under-valuing the welfare of future generations. Nathan yes I’ve heard that too, and that critique seems a bit unfair. I have a positive impression of Nordhaus’ intellectual integrity. 2) invest it productively, so you’ll have more resources to work with when the time comes to adapt to the change you didn’t prevent. There is no valuing, even implied, of the welfare of future generations compared to today’s. 1) not all impacts of climate change offer the alternatives of mitigation and adaptation; for some, the alternatives are mitigation and suffering. The more severe the projected climate change, the larger this part is likely to be. How does the monetary equivalence for “suffering” — a trivial example, the loss of coastal wetlands and their enjoyment as outdoor environment — behave as GDP goes up? 2) Prices will change within the economy when GDP goes up. E.g., “on-the-spot products” like houses will get relatively more expensive, being not as readily automatable/outsourcable. Many adaptation tools like levees, or the transfer of infrastructure to higher ground, or keeping desertifying regions viable for agriculture, are of this nature. There are two key numbers in doing climate action cost/benefit analyses. One is the discount rate (discussed by a few commenters here), which I think is rather subjective, but generally ranges from 2 to 5%. Stern used 1.4%, which some have criticized as too low, whereas Nordhaus has (at least in some recent research) used 5%, which could certainly be criticized as too high. From what I’ve seen, 2-3% is the most generally-accepted discount rate range. I think governments often use 3%. The second key number is the social cost of carbon, which is basically an estimate of the direct effects of carbon emissions on the economy, but also depends on the discount rate (higher discount rate means less effective future economic cost, and thus lower social cost of carbon). I think Nordhaus tends to be quite conservative on both values. The first link above compares recent papers by economists Epstein and Nordhaus (and co-authors). Epstein’s social cost of carbon estimate was about 4 times higher than used in the Nordhaus paper ($7.36 vs. $30 per ton of CO2). Some have argued that even Epstein’s social cost of carbon estimate is far too low. U.S. government agencies generally estimate it at between $19 and $68 per ton of CO2, consistent with the Epstein estimate. $7 per ton of CO2 is certainly at the low end of plausible values. Depite being so conservative, Nordhaus argues for taking action to address climate change by putting a price on carbon emissions. That says a lot – there’s just no economic justifcation for failing to take action to reduce CO2 emissions. Politicization of the science of natural events to benefit either side is beyond reproach. Whether you call it global warming or euphemistically “climate change”, there is a lot of public money at stake to save the world. Manmade influence causes some weather influence, albeit very small in terms of impacting the entropy surrounding us. Warming and cooling will continue to fluctuate as long as it has in the past. Again, one little volcano……. Like global over-population, any anthropogenic “climate change’ will take care of itself. We will eventually run out of fossil fuel deposits. Alternative energy sources can be competitively introduced without any political self-interest, creation of new regulatory agencies or forced government(s) redistribution of tax base revenues. In the end, as I have said many times, there are so many more great causes to promote that can have immediate and positive impacts on the human condition. Well, the nice way to put it is that your friend is an agnotologist. The not-so-nice way to put it is that your friend is begging for people to tell him lies that he can believe. Really, if after all your debunking of lies, he still thinks the lies don’t matter, then what other conclusion is there? Also, out-of-context e-mails are … out-of-context. Without the context to fill in what the e-mails are really about, they prove nothing. Actually Frank, they are not really out of context. The dirty denialist mind fills in the blanks. Projection. Again Paul, I have been very slow to spot your return to this page. The Barry Bickmore presentation I was telling you about (now re-posted on my blog with his permission), has a very good section on why we should all pay no attention to the likes of Spencer, Michaels or Lindzen (view from about 19min 18sec). The stupidity of Climategate 2.0 is that, by publishing a second tranche of emails data mined prior to 2009, the perpetrators proved their intent was merely to discredit climate scientists and prevent UNFCCC progress. I very much doubt they will do it again but,if they do then they are more stupid than they already appear. Yes probably we are responsible for global warming but the problem is that so many people speak about it but so few take some actions to prevent that.